You Have the Power to Heal: A Guide to Change Life Stories by Melissa Merritt is an unconventional approach to healing and the path to happiness accessible to everyone. In these pages, the author shares her healing journey, from a hurt and splintered life to one of inner freedom, happiness, and an elevated state of peace. After listening to her story, I was left with only one conclusion — she's found a genuine path to healing. While sharing her personal experiences, the author offers powerful insights on overcoming the path, understanding generational pain, developing an energy awareness and using positive energy to heal — daily — and the importance of changing perspective and a lot, lot more. Melissa Merritt writes with simplicity, a style that derives from the confidence of lived experience. She takes readers on a step-by-step path that will help them to heal the different forms of pain in their soul. This is one of those books with a strong appeal to fans of New Age spirituality, a book that unveils the secret that everyone possesses — their power to heal. This book will change the way we understand pain and our attitude towards healing, opening our eyes to the immense spiritual energy available to us. You Have the Power to Heal: A Guide to Change Life Stories is written in a popular, conversational style that makes the message very accessible to the audience. The narrative voice is strong and steady, the message timely and revolutionary. It is one of those books that everyone needs to read. A rare gift of faith and love. By sharing her personal journey to healing, author Melissa Merritt has written a thought-provoking, powerful nonfictional work titled You Have the Power to Heal: A Guide to Change Life Stories. This journey included many mystical, as well as down-to-earth, experiences; these are both mind-boggling and thought-provoking. The book highlights certain concepts such as the importance of changing one’s thoughts, connecting to the spiritual guidance available to all, and working with energy healing modalities. There is an element of awakening to spiritual truths that were not part of the institutional religion in which she was raised. The book explores the metaphysical side of spirituality and is non-denominational. Additionally, there are a number of tools for the reader to use; these include meditations, exercises, cleansing rituals, and choosing and reading tarot or oracle cards. The question-and-answer section is certainly enlightening. Although there is a great deal of information included in this book, there is a smooth flow to it. There is a conciseness, and yet a fullness, to the writing style. The descriptions of actual events make the reader feel like a witness to them. The storytelling, blended with factual information, is both engaging and instructive. Adding the meditations and exercises gives the reader specific ways to move forward in his/her own journey; this book offers more than just heartwarming stories, although these are wonderful! You Have the Power to Heal: A Guide to Change Life Stories by Melissa Merritt is a beautiful book that will be cherished by those who are committed to healing the mind, body and spirit. You Have the Power to Heal is a work of spiritual self help by author Melissa Merritt, self described as ‘A Guide to Change Life Stories’. With the mantra throughout that happiness is a discipline which must be worked at, Merritt takes her readers through her own personal routines and strictures for dealing with the inevitable traumas that we must all face in life. Focusing on various different aspects of a person’s life that they can work on, the book employs both practical applications and techniques from the spiritualist ‘body and mind’ ideology to create a connection to a higher power. This higher power, Merritt, states, is the key to moving beyond suffering and letting the pain inside us heal. I really like the idea of this book, and its author, Melissa Merritt, writes with great positivity and conviction that I’m sure many readers will find encouraging and inspiring. Some of the advice seems to rely on readers already understanding a few principles of spiritualism and the idea of ‘energies’ without those being fully explained, but for the most part the text is clear and easy to follow. It is certainly true that change only comes to those who work for it, and the approach in this book considers many sources of both pain and happiness, from physical factors to relationships with others and to the wider universe. Overall, You Have the Power to Heal would provide a good starting point to inspire others into a more spiritual way of viewing the world. 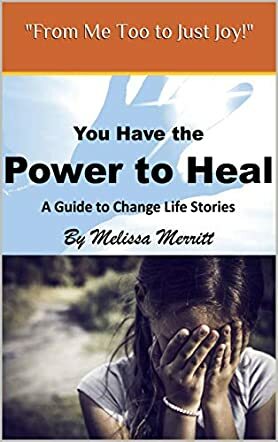 You Have the Power to Heal: A Guide to Change Life Stories by Melissa Merritt is a non-fiction memoir based on Melissa’s life experiences to overcome trauma or abuse and find the way towards healing. You Have the Power to Heal starts off with an introduction to Melissa, her background, and what brought her onto this path of seeking and self-reflection. The book then continues with a number of chapters in which Melissa talks about her personal experiences dealing with loss and love, grief, forgiveness, children, past lives and reincarnation, the meaning of life, suffering as a human condition, and more. She draws upon many metaphysical concepts as well as an exploration into the realms of spirituality to describe her experiences and thoughts. There is also a dialogue summary at the end in the form of questions and answers to some of the most frequently asked thoughts and questions that people face. You Have the Power to Heal: A Guide to Change Life Stories is an interesting book on the subject of metaphysics and the ways to live a better, more hopeful life. The content is not necessarily chronological and, in that sense, I felt that anyone could read this book from anywhere. Melissa’s writing style is simple and in the first person voice and this makes the book relatable to readers. Although some of the propositions and solutions expounded sounded a bit familiar to me, I think overall this book is a worthwhile read for people looking for peace or solutions to tough life situations. It may provide food for thought and so, in that sense, this memoir achieves its purpose. The world around us is vast, but possibly even more vast is the iceberg that is each of us. There is the small amount that we have seen and the vastness that is hidden beneath the waves, waiting for us to reach out for it. Learning just how to reach into our deepest selves and unlock our hidden potential and our hidden thoughts and desires is a complex path. It’s also a path that travels through different religions, different theories and practices. It wanders difficult areas of the world, but not countries. Instead, it wanders through space and time to all of the aspects of our lives. That is what You Have the Power to Heal: A Guide to Change Life Stories is all about. This book is written for those who are seeking answers to what seem to be unanswerable questions. It is for those who are struggling to understand themselves or the world around them. Even those who are questioning things in life that just don’t make sense. You Have the Power to Heal by Melissa Merritt is all about stories in her life that changed the way she sees herself and the world around her. But it’s also a story of just how you can use those thoughts and experiences to help you find your own path. This book will help you explore what seems an entirely different world, with firsthand accounts of amazing things that have occurred in her life and how they led her to this place on her own journey. She’s tried a little of everything, and reading this book may help each of us to accomplish more within our own lives.